Delivering unbiased science and information on mineral resource potential, production, consumption, and how they interact with the environment. An interdisciplinary organization advancing the use of science in natural resource decision making. Supporting scientists and students to analyze specimens for a variety of scientific research objectives. Supporting science by providing information on geologic, plant, and animal specimens to advance methods and techniques unique to nuclear reactors. The Energy and Minerals Mission Area conducts research and assessments that focus on the location, quantity, and quality of mineral and energy resources, including the economic and environmental effects of resource extraction and use. Following an assessment of geologic carbon storage potential in sedimentary rocks, the USGS has published a comprehensive review of potential carbon storage in igneous and metamorphic rocks through a process known as carbon mineralization. Garcia-Castellanos, Daniel; O'Connor, Jim E.
Garcia-Castellanos, D., and O'Connor, J.E., 2018, Outburst floods provide erodability estimates consistent with long-term landscape evolution: Scientific Reports, https://doi.org/10.1038/s41598-018-28981-y. Beisner, Kimberly R.; Gardner, W. Payton; Hunt, Andrew G.
Stock, G.M., Guerin, A., Avdievitch, N., Collins, B.D., Jaboyedoff, M., 2018, Rapid 3-D analysis of rockfalls, GSA Today, Groundwork, v. 28, https://doi.org/10.1130/GSATG374GW.1. Digital geologic maps of the U.S. States with consistent lithology, age, GIS database structure, and format. Mine plants and operations for commodities monitored by the National Minerals Information Center of the USGS. Operations included are those considered active in 2003 and surveyed by the USGS. Maps of facilities for both international and domestic locations. Miller, David M.; Reynolds, R.E. ; Groover, Krishangi D.; Buesch, David C.; Brown, H. J.; Cromwell, Geoffrey; Densmore-Judy, Jill; Garcia, A.L. ; Hughson, D.; Knott, J.R.; Lovich, Jeffrey E.
Miller, D.M., Reynolds, R.E., Groover, K., Buesch, D.C., Brown, H.J., Cromwell, G.A., Densmore, J., Garcia, A.L., Hughson, D., Knott, J.R., and Lovich, J., 2018, Against the current-The Mojave River from sink to source; The 2018 Desert Symposium Field Trip Road Log: California, Desert Symposium meeting in April of 2018. Fairclough, M. C.; Irvine, J. A.; Katona, L. F.; Simmon, W. L.; Bruneton, P.; Mihalasky, Mark J.; Cuney, M.; Aranha, M.; Pylypenko, O.; Poliakovska, K.
Fairclough, M.C., Irvine, J.A., Katona, L.F., and Slimmon, W.L., 2018, World distribution of uranium deposits, second edition: International Atomic Energy Agency, Vienna, Austria. Matasci, Battista; Stock, Greg M.; Jaboyedoff, Michael; Carrea, Dario; Collins, Brian D.; Guérin, Antoine; Matasci, G.; Ravanel, L.
Matasci B., Stock G.M., Jaboyedoff M., Carrea D., Collins B.D., Guerin A., Matasci G., Ravanel L., 2018, Assessing rockfall susceptibility in steep and overhanging slopes using three-dimensional analysis of failure mechanisms: Landslides, Vol. 15(5), 859–878 . Stanley, Richard G.; Potter, Christopher J.; Lewis, Kristen A.; Lillis, Paul G.; Shah, Anjana K.; Haeussler, Peter J.; Phillips, Jeffrey D.; Valin, Zenon C.; Schenk, Christopher J.; Klett, Timothy R.; Brownfield, Michael E.; Drake, Ronald M.; Finn, Thomas M.; Haines, Seth S.; Higley, Debra K.; Houseknecht, David W.; Le, Phuong A.; Marra, Kristen R.; Mercier, Tracey J.; Leathers-Miller, Heidi M.; Paxton, Stanley T.; Pearson, Ofori N.; Tennyson, Marilyn E.; Woodall, Cheryl A.; Zyrianova, Margarita V.
Stanley, R.G., Potter, C.J., Lewis, K.A., Lillis, P.G., Shah, A.K., Haeussler, P.J., Phillips, J.D., Valin, Z.C., Schenk, C.J., Klett, T.R., Brownfield, M.E., Drake, R.M., Finn, T.M., Haines, S., Higley, D.K., Houseknecht, D.W., Le, P.A., Marra, K.R., Mercier, T.J., Leathers-Miller, H.M., Paxton, S.T., Pearson, O.N., Tennyson, M.E., Woodall, C.A., and Zyrianova, M.V., 2018, Assessment of undiscovered oil and gas resources of the Susitna Basin, southern Alaska, 2017 (ver. 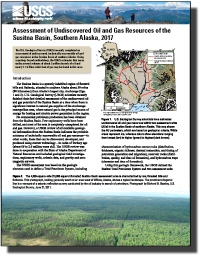 1.1, May 11, 2018): U.S. Geological Survey Fact Sheet 2018–3017, 2 p., https://doi.org/10.3133/fs20183017. 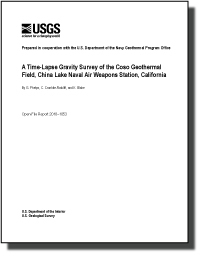 Phelps, G., Cronkite-Ratcliff, C., and Blake, K., 2018, A time-lapse gravity survey of the Coso geothermal field, China Lake Naval Air Weapons Station, California: U.S. Geological Survey Open-File Report 2018–1053, 25 p., https://doi.org/10.3133/ofr20181053. Wells, Ray E.; Haugerud, Ralph A.; Niem, Alan; Niem, Wendy; Ma, Lina; Madin, Ian; Evarts, Russell C.
Wells, R.E., Haugerud, R., Niem, A., Niem, W., Ma, L., Madin, I., and Evarts, R., 2018, New geologic mapping of the northwestern Willamette Valley, Oregon, and its American Viticultural Areas (AVAs)—A foundation for understanding their terroir: U.S. Geological Survey Open-File Report 2018–1044, https://doi.org/10.3133/ofr20181044. Oberlindacher, H. Peter; Hovland, R. David; Miller, Susan T.; Evans, James G.; Miller, Robert J.
Oberlindacher, H.P., Hovland, R.D., Miller, S.T. 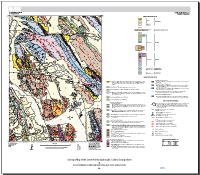 , Evans, J.G., and Miller, R.J., 2018, Geologic map of the Lower Valley quadrangle, Caribou County, Idaho: U.S. Geological Survey Scientific Investigations Map 3215, 6 p., 1 sheet, scale 1:24,000, https://doi.org/10.3133/sim3215. Fornaroli, Riccardo; Ippolito, Alessio; Tolkkinen, Mari J.; Mykrä, Heikki; Muotka, Timo; Balistrieri, Laurie S.; Schmidt, Travis S.
Riccardo Fornaroli, Alessio Ippolito, Mari J. Tolkkinen, Heikki Mykrä, Timo Muotka, Laurie S. Balistrieri, Travis S. Schmidt, Disentangling the effects of low pH and metal mixture toxicity on macroinvertebrate diversity, Environmental Pollution, Volume 235, 2018, Pages 889-898, ISSN 0269-7491. This image is a screen capture of the application that highlights the USGS Domestic Continuous (Unconventional) Oil & Gas Assessments, 2000-Present. Did you know there are more than 57,000 wind turbines in the United States? In this video, we'll show you how you can get to know each and every one of them with our U.S. Wind Turbine Database and viewer, which we've assembled in partnership with the U.S. Department of Energy, DOE’s Lawrence Berkeley National Laboratory and the American Wind Energy Association. Tim Collett, USGS research geologist, presenting at the Korean Institute of Geoscience and Mineral Resources' (KIGAM) international program for geoscience resources. Media: Please join the U.S. Geological Survey, CGG Airborne, and various partners for a demonstration takeoff of the low-flying helicopter and description of what scientists are seeking in/around the Mississippi Alluvial Plain. Please RSVP to Heidi Koontz at 720-320-1246 or hkoontz@usgs.gov. Data acquired by the U.S. Geological Survey on the U.S. Atlantic Margin in August 2018 reveal new information about the distribution of gas hydrates in the sector stretching from the upper continental slope to deep water areas offshore New Jersey to North Carolina. The atypical location of Mount St. Helens may be due to geologic structures that control where deep magmas can rise through the crust, as suggested by new findings published today in Nature Geoscience.